We got ourselves a new Mario Party for the Wii U after the last one was released for the Wii three years ago in 2012. But what’s stayed, what’s different, and is it enough to warrant a purchase? First off, Party Mode. I’m going to say it right now, I don’t like what they did. While I do give some credit to Nintendo for sticking to their guns with the big changes they made in Mario Party 9, I just don’t find it fun. 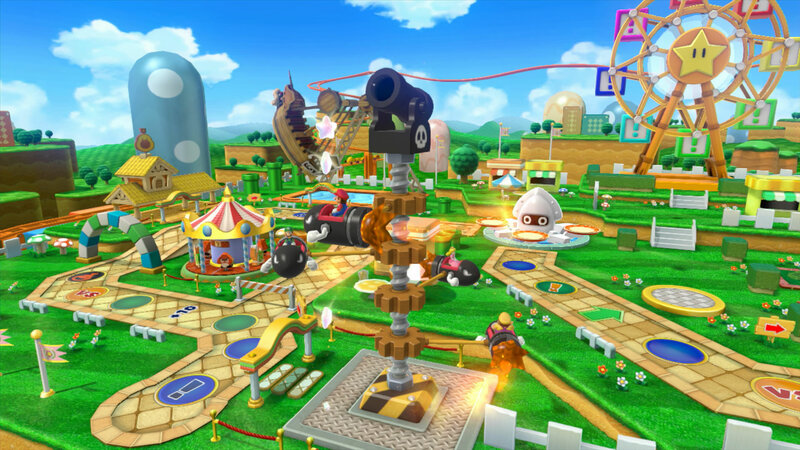 The change they made was to have everyone move around in one large vehicle, with everyone rolling a dice in turn to see how far they go, instead of the system used from every game up to Mario Party 8, whereby everyone moved around like a regular board game. It removes my favourite aspect of Mario Party, screwing someone over by doing things like nabbing a star from right in front of someone, or sending someone to the beginning of the board. The game also changes how often mini games occur, only happening when landing on set circles on the board, and not after everybody has had a turn. So there’s less of a competitive aspect and you don’t play as many of the fun mini games. Great start. Speaking of the mini games, they’re actually kind of cool. Not the strongest showing they’ve ever had, but there are some fun mini games and they do the job. The free for all games are great, one example would be a golfing game, where the objective is to hit a golf ball as soon as it appears. Points are dished out based on reaction times. Sometimes a bomb appears though, and you lose points, so it becomes a game of reactions, and more importantly not reacting when a bomb appears. Team games are pretty fun too, but the three-on-one’s are not so strong. They seem to be very heavily favoured to one side or the other and not really much of a competition. This usually means that there is the one dodging things from the three, or the three dodging things from the one. Sadly there’s not much innovation in this area as a whole, and there’s not even that many of them to boot, which is a little disheartening when this is the first Mario Party on Nintendo’s newest console with lots of space to store things. 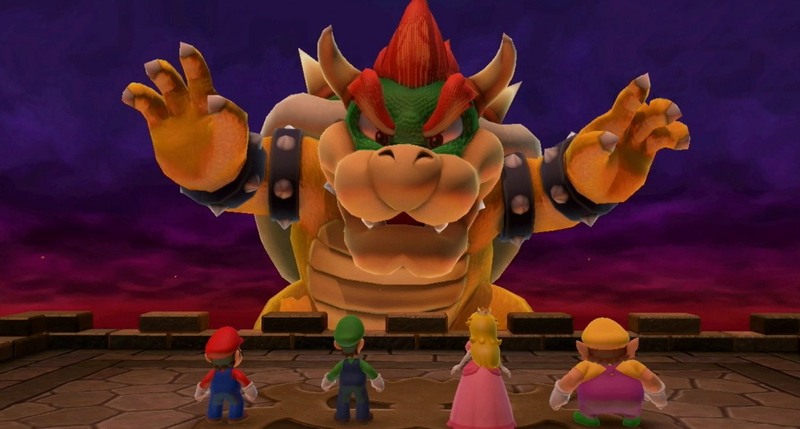 Where they have made some changes, is with the new Bowser mode. This is the flagship mode for the game it seems pitting 4 humans, or AI to make up numbers, against one player in control of the gamepad, playing as Bowser. It plays much like the standard game; the four in the big vehicle take turns rolling a dice and moving forward along the board, trying to make it to the end to get a star. When all of them have taken their go, Bowser gets a roll to give chase. If/when he finally catches up, you play a mini game. This time, everybody is playing against Bowser, and you all have lives. If you lose the game, or lose all of your lives in the mini game, you’re out of the car. Bowser’s goal is to get everybody to 0 so he can win. 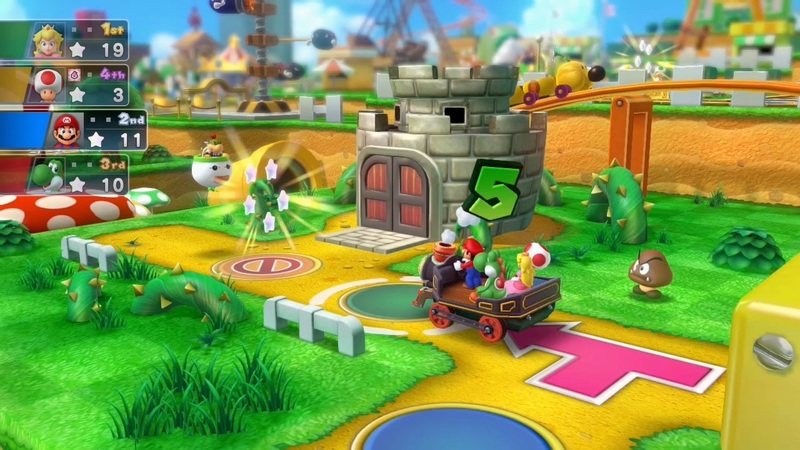 It makes for a nice change of pace, as depending on the board, the Bowser player can set up traps if players land on certain spaces, and it’s a mode where everyone riding in the same car actually kind of makes sense for a change. The last big mode the game shows off, is only accessible to the collectors who have their hands on a few Amiibos. This actually gives a use to the ones you managed to get hold of, like Rosalina if you’re lucky enough to have her. Anyway, this looks much like the original Mario Party style, everyone moving around a board by themselves, collecting items and getting stars with coins. Sadly though, it’s still not that good. The game comes down to four people sitting around the gamepad, holding the Amiibo over the pad so you can roll the dice, letting it move a few spaces, and then it’s the next person. The same issue of not playing many mini games is also a problem here, along with the whole Amiibo functionality just not being that good on the whole. Yes, you can use different ones to make the board sections look slightly different and have small little extras depending on the theme of the board, and it’s nice to finally have a use for the all small plastic statues I’ve collected, but it’s just a shallow reminder of what Mario Party was. To my surprise, the best bit’s about the entire game are actually all of the mini games and sub modes contained within the game. There’s the mini game tower, a mode whereby everyone gets points based on their ranks in the set number of mini games played, winner is the one with the most at the end. Not exactly ground breaking stuff, but it allows you to actually play the mini games pretty regularly unlike the main board game. The one I’ve probably played the most is the Badminton game, which is exactly what you’d think; It’s for two or four players, and you play badminton. Standard issue stuff! Simple controls for hitting, and you play with a d-pad. It’s Nintendo doing what Nintendo does best, they’re not great at being original for the most part, but they can polish their old ideas or someone else’s idea into something great, which is exactly what they did for Mario Kart 8, and I’ve put way more time than I should have into that game, it’s just so good! Plus, it has some great DLC packs, a first for Nintendo! Overall, I’m left just feeling disappointed. I was really looking forward to this on my Wii U, and to putting in lots of hours. I’m not sure whether Nintendo were scared to try something new after 9 polarising their audience, or they wanted to give the ideas from 9 the best shot they could. Either way I wasn’t very impressed. Oh, and the Amiibo integration is pretty weak and kind of annoying to play. Mario Kart 8 tried some different things and it’s bloody fantastic. But I don’t know what they can do with Mario Party, they’ve been trying this for years now, and the original trilogy is still the best of the lot according to general consensus. I think they need to go back to what worked, a board to go around by yourself, lots of different and fun boards, and a ton of mini games. This entry was posted in Uncategorized and tagged Amiibo, Mario Kart 8, Mario Party 8, Nintendo. Bookmark the permalink.